Quality clothing, made with quiet flair and a simple philosophy: that being different comes from within. With six decades of expertise to our name, we’re masters at making contemporary clothing for men and women that speaks volumes, without ever making a scene. No false promises, no pretentiousness - just hard earned heritage, and a reputation for timeless craftsmanship. Vedoneire is a family-run apparel brand from Ireland which was established in 1951. 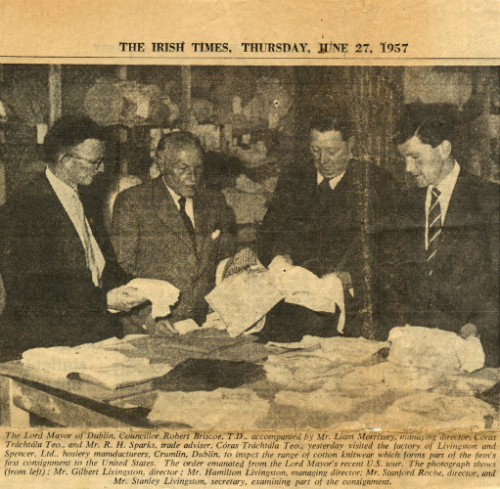 Founded by textile lecturer Hamilton Livingston and his sons Gilbert and Stanley - the company has seen many changes, from the early manufacturing companies employing 240 in Dublin to the range of products we have built today and the strengthening of the brand. Today the company is run by Mark Livingston, the grandson of Hamilton, a true family-run brand and a rare thing in the world of Apparel. We like to offer our customers a more personable approach, from customer service through to offering advice on choosing the right product. While modernisation is part of our commitment, we will never lose sight of our traditional values - we take great pride in this approach, we feel it's refreshing to deal with our valued customers on a one-to-one basis - we hope you do too.